I always ended up just creating a new rounded rectangle if the existing one don't work. Is there a way to modify the corner radius without having to create a new shape? I know I can modify the bezier handle manually one-by-one, but I can't figure out how to do this in a more accurate way for all 4 corners. Simply hold and drag the round blue handles in each corner. You can change the border radius of all four corners with precision by using the Shape Options and simply enter a new measurement for your corners. To change only one corner or give a different corner radius value to each of them, click the chain in the middle and fill the corner radius field for each corner. It seems like the best way is to use the Stylize/Round Corners effect on a regular rectangle. This way the corner radius is changeable and independent of the rectangle transform property. With this method, the Appearance panel will have a Round Corners setting for any round rectangle paths. This will allow you to edit the corner radius for existing shapes. 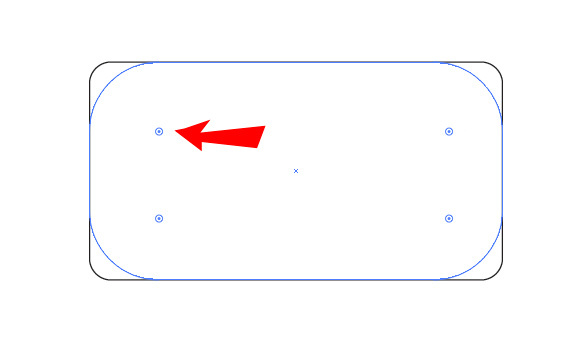 While drawing rounded rectangle (while still holding your mouse button), press UP and DOWN arrows to change radius. It is common way of changing attribute values of certain tools in AI. Seems you've already figured out that the Stylize Effect is a better method. If you want to go one step further check out VectorScribe from http://www.astutegraphics.com it's a fabulous plug in that will allow you to not only continually round any corner but also had many other very useful features. Not the answer you're looking for? Browse other questions tagged adobe-illustrator vector borders or ask your own question. 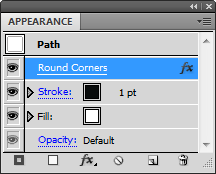 Illustrator CS4 - how to find out the radius of rounded rectangle corners? How can I create rounded corners In Adobe Illustrator in a specific way? How to use a shape as a vector mask?